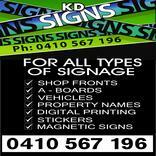 For all types of signage, business cards, flyers and stickers. 3D lettering. Vehicles, Shop fronts, free standing signs and much more. Willing to travel. Free quotes. Quality of work. Competitive prices. Prompt service. Fully insured. 30 years in the industry. Customer satisfaction. Use of only high grade materials. Started handwriting signs 30 years ago which allowed me to start from scratch in the sign industry, learning layout , technique and other essentials of the trade. Most aspects of the trade . An invoice is provided at the end of the job ( balance 30 days) For work over $1000 a deposit of 30% is required to cover some materials. I do not have many large overheads, therefore I can keep my prices competitive. Try and keep your advertising fairly simple as this will aid your design or logo in being recognised. Don't leave the signage till last when opening your business. Have a clear understanding of budget. Size of job, materials required, placement of signage and colours. Whether the job is to be in just normal vinyl or digitally printed vinyl. What is your limit for the job? Yes I have liability insurance up to $10, 000 000. I will guarantee my work for the longevity of materials used. The main question usually is how much? When can you do the job? My answer is the cost factor depends on the quality of the materials used and any hidden factors ie erecting signs to different structures. The time limit on the job depends on the availability of artwork and materials needed for the work. What materials will be used for the job? Can you show me an example of a similar job? Do you have any customer recommendation? The satisfaction of designing and then creating sign is the highlight for me. My father was a signwriter and very good at art, I just naturally followed in his footsteps.